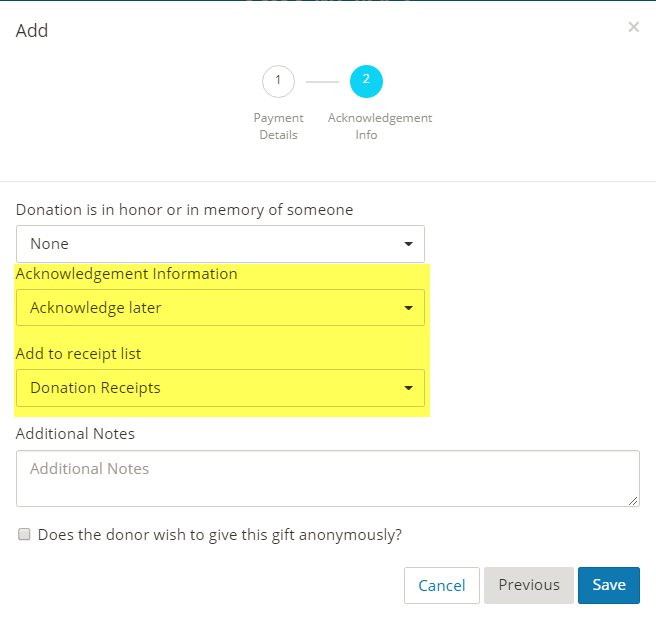 In GiftWorks Cloud, all donations are now recorded as payments. Payments can be for certain dollar amounts or for in-kind donations (zero-dollar items). 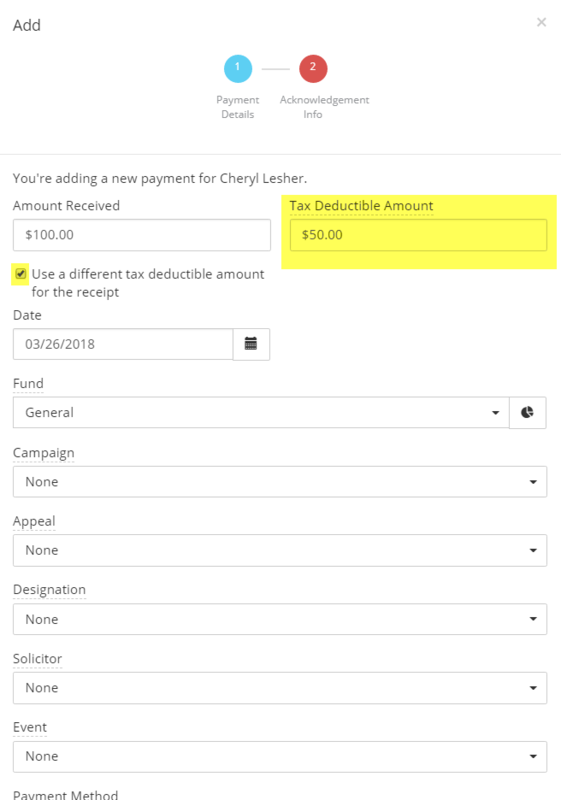 You can add a payment from a constituent profile, or from the Gifts tab in GiftWorks Cloud. Step 1- Identifying the Constituent You can first view a constituent profile and then click "Add Payment" on the top right of their profile. Or you can click the Gifts section of GiftWorks Cloud and select "Add Payment" on the top right of the Gifts section. Step 2- Payment Details: Enter the amount received. If the amount received differs from the tax deductible amount, because the constituent received a benefit from their payment, check the box next to "Use a different tax deductible amount for the receipt" and enter the tax deductible amount. For the rest of the page, enter information as needed. The only required fields on this page are: amount received, date, fund, and payment method. Click "Next" to continue. Step 3- Acknowledgement Information: On this page, you can add honor/memorial information if applicable. You will also have the opportunity to add the payment to a thank you letter or receipt list. To add a payment to a thank you letter list, underneath Acknowledgement Information select "Add to 'Thank You Letters' mailing list." Selecting this option will simply add this payment to the mailing list to be thanked, and once it has been added to that queue you would go to the Mailings section of GiftWorks and proceed with the mailing process to send the letter. To add a payment to a receipt list, click "Acknowledge Later" and then select the receipt list that you'd like to add the payment to. Once you have sent the receipt through the Mailings area, the receipt information (including receipt number and receipt date) will be automatically added to the payment. Step 4- Saving the Payment: After reviewing the details selected within this window, you can complete this process by selecting "Save". This will then add the payment to the constituents record along with adding it to your list of payments already in the database.